Up until December I wasn’t too fond of Germany. My only experiences with it were ones of feeling super Jewy when I visited Munich back in 2006 on MayMay & SchaeffSchaeff’s Eurotrip. I thought Munich was so pretty, so clean, and that the people were almost too nice. I felt like it was a completely sterile place, and maybe that was because they were trying to cover up a horrible past. Or perhaps I was projecting. Who knows, but I’m not the only one to have these thoughts. I’ve heard the same from non-superjews alike. I still hold these feelings towards Munich, however, my feels towards Germany changed after visiting Berlin over Christmas. 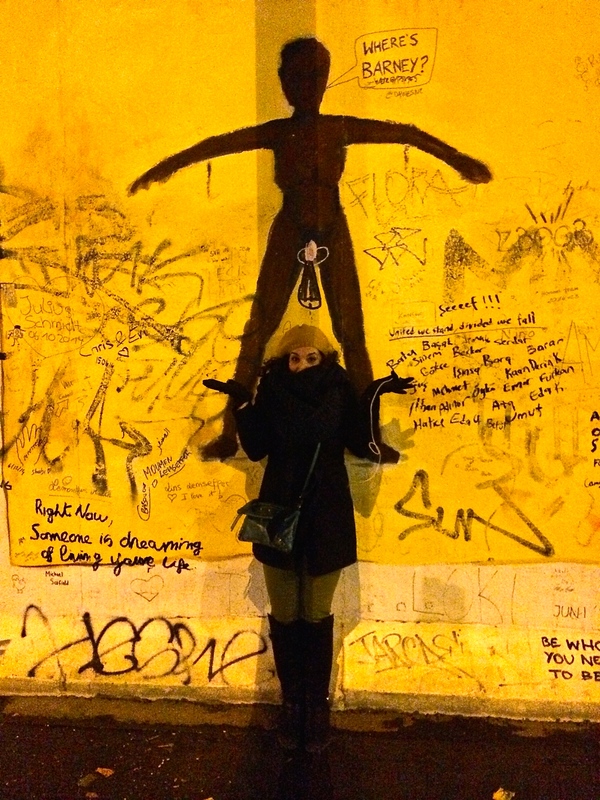 Since then I have found myself telling people that Berlin is my new favorite city in Europe, and perhaps the world. 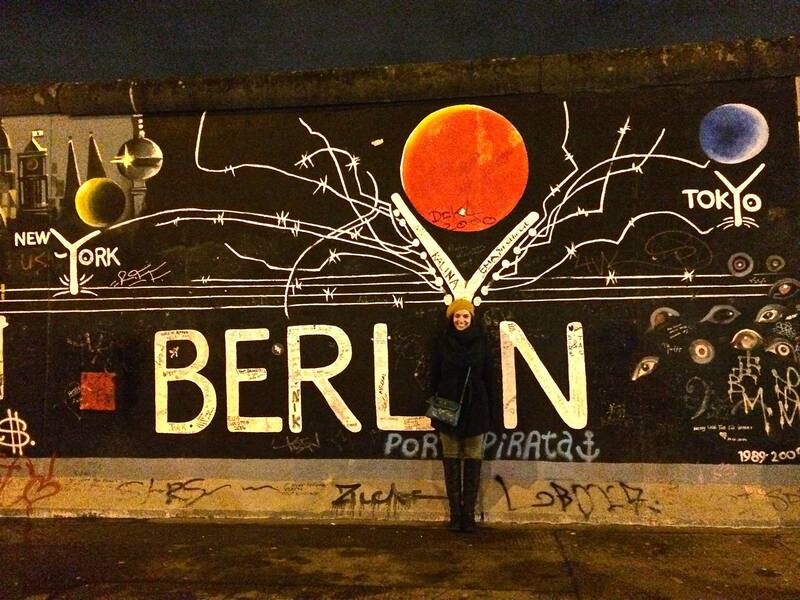 I am obsessed with Berlin, and I only scraped the WWII and Cold War surface. I have never really been one for wanting to return to a city if I’ve already been there, I’d just rather visit somewhere new. But, that is totally not the case with Berlin. I NEED to go back. And I must return with sista so we can get our WWII Jew on. 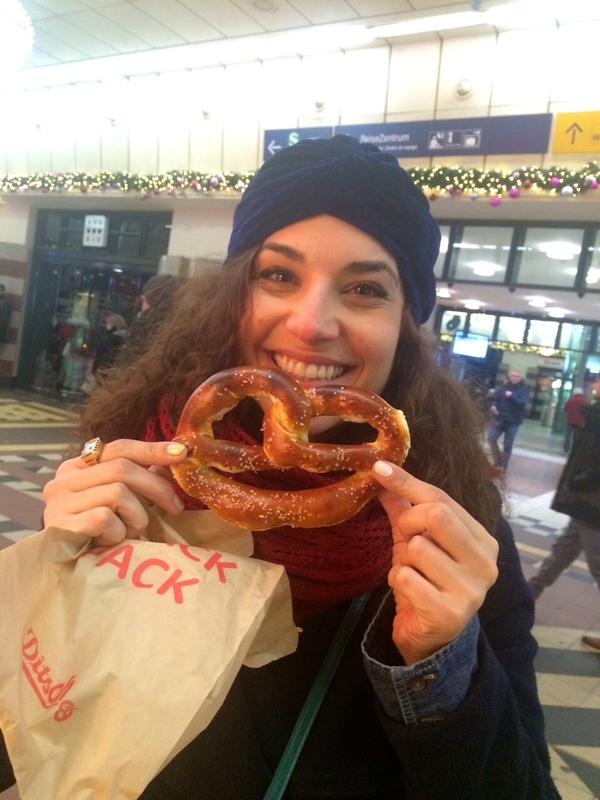 Berlin has the history, it has the art, it has the architecture, and it has the sausages. All things that make Danielle a very happy camper. 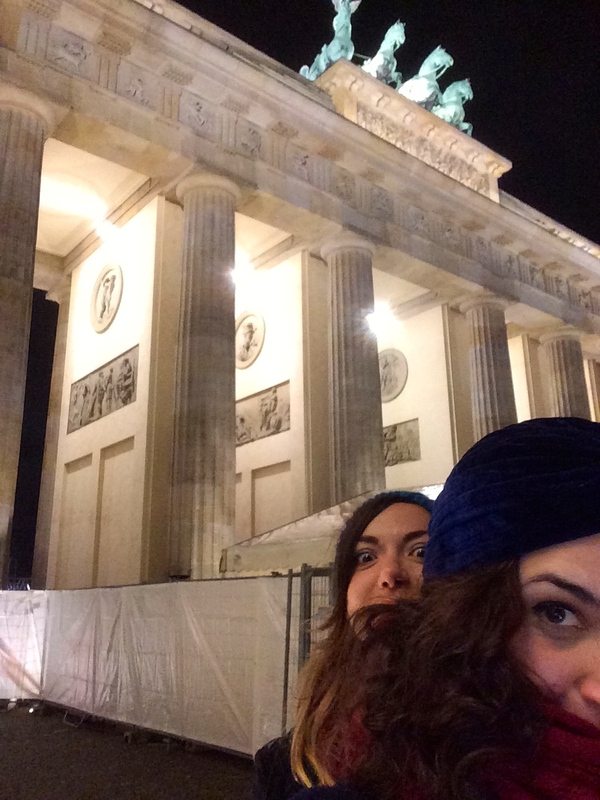 Quite a chunk of my time in Berlin was spent doing walking tours. 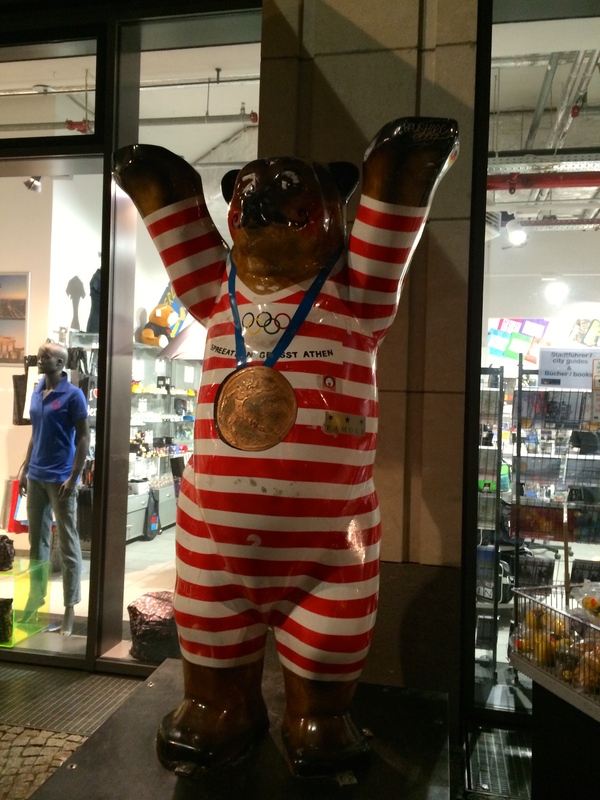 I usually like having the freedom to wander off down who knows where, but after taking a look at the walking tours offered by New Berlin walking tours, I decided that many of the things I wanted to see were best seen when you get the full story behind them. I could show up at the Reichstag building and look at it, but not get the full story of how Hitler came to power here, or search and search for Hitler’s bunker, only to find out that it is located in the middle of an apartment complex. Or I could walk along the Berlin Wall memorial and not know that the circular placards on the sidewalk were for those who successfully escaped over the wall. The tours were so well led, and so fascinating. I feel like I left Berlin with a whole new stash of knowledge. The day after Christmas, Jen and I went our separate ways for the day after a snowy morning stroll through Tiergarten park. She went to a photography museum while I went on a Third Reich walking tour to get my daily fix of Hitler knowledge. The tours all meet in front of the Starbuck’s in Pariser Platz in front of the Brandenburg Tor. With a student ID (thank you España) tours cost 10 euro (12 euro full rate). My tour guide was an Irish guy named Mark, and he was excellent. Now, to highlight some of my favorite sites seen on this walking tour, because quite frankly, it’s a lot of historical stuff, and you probably learned all about it in your high school history classes. But, to be there was quite something else. I was really excited for this, though I thought we were actually going to get to go into his bunker. Unbeknownst to me, the actual bunker itself has since been destroyed, so as not to serve as a mecca for neo-Nazis. 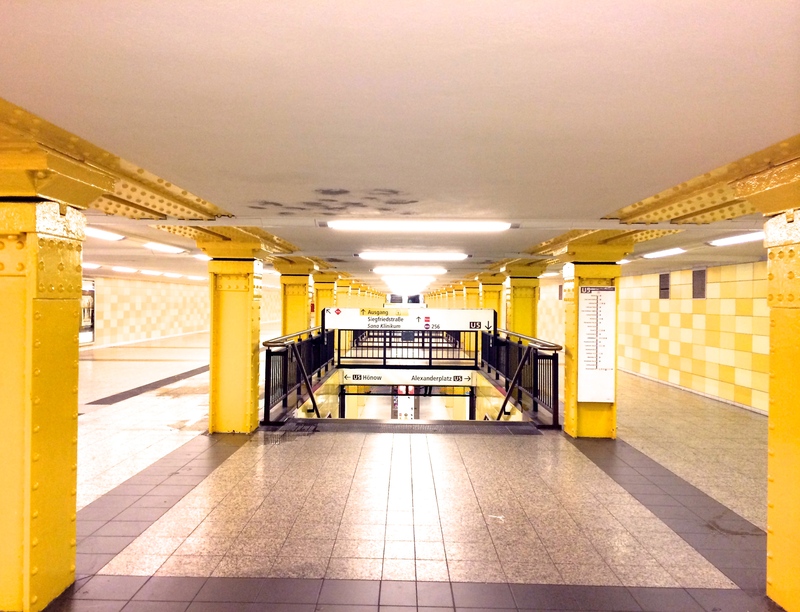 However, the location of the place where Hitler made the most brilliant decision of his stupid life now lies underneath a very industrial set of apartment and parking complexes at Wilhelmstrasse 77. Even if nothing was underneath my feet, it felt good to stand above the place where that horrible excuse for a human being spent the final days of his life. This is the German Parliament building, and where Hitler rose to power in 1933 after being appointed Chancellor by President Paul von Hindenburg. This building suffered a fire in 1933, which is still unsolved to this day, and is also home to the memorial to the 96 Murdered Members of the Reichstag who voted against the Nazi party and were inevitably sent to their deaths – many at Sachsenhausen concentration camp in Germany. The building also stood as a huge target when the Cold War began, physically lying in West Berlin, yet still close to East Berlin. Sachsenhausen was the first camp established in Germany, and was where many political prisoners were sent to die. Kristallnacht (‘the night of broken glass’) happened on November 9, 1939. It was a night when all Jewish establishments were torched and destroyed. 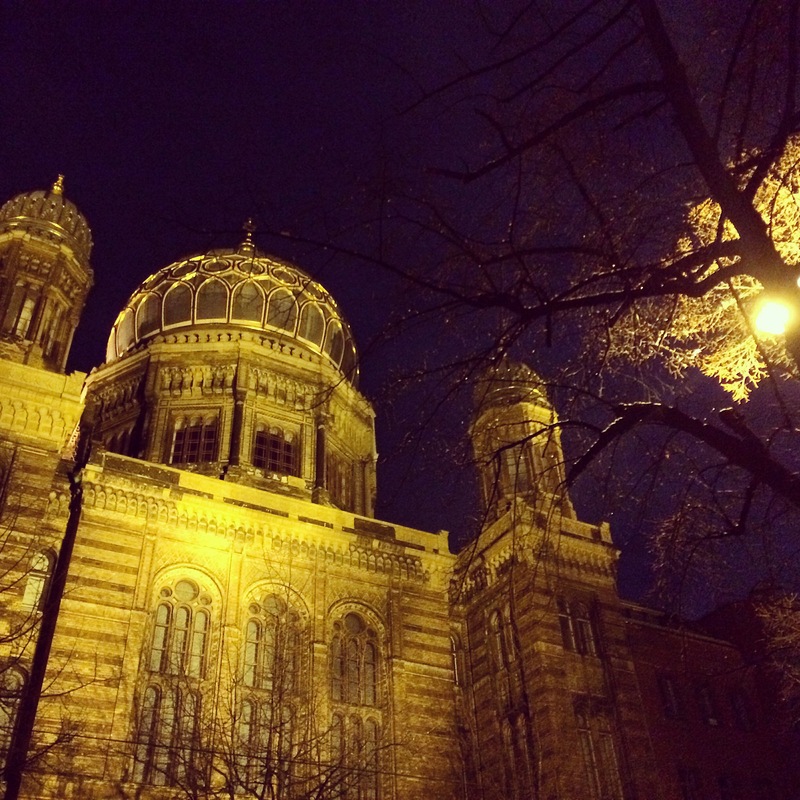 One of the few temples to survive the horrible night was the New Synagogue, located on Oranienburgstrasse. The story goes that during the night, the inside of the temple was in the midst of being destroyed and burned. In the morning, a police officer arrived on the scene declaring that this temple is a protected historical landmark, and any destruction to it is illegal. With that, the temple was salvaged, and good thing it was, because it is majestic and beautiful, even in the moonlight. I’ve seen so many Holocaust memorials, and I really look forward to them. The memorial in Berlin is one of the more interesting ones that I’ve seen, mostly because it’s so industrial and a bit cold. Though, maybe that was the aim they were going for. It is essentially a sea of cement blocks of varying heights. 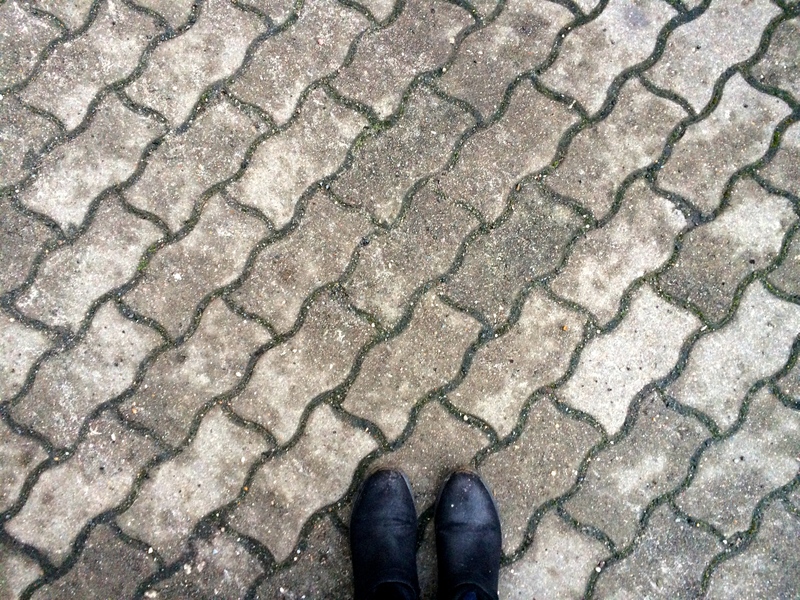 You have the freedom to walk through it, and watch the blocks get smaller to taller as you move through the wavy alleys. If anything, it makes for a cool photo shoot. 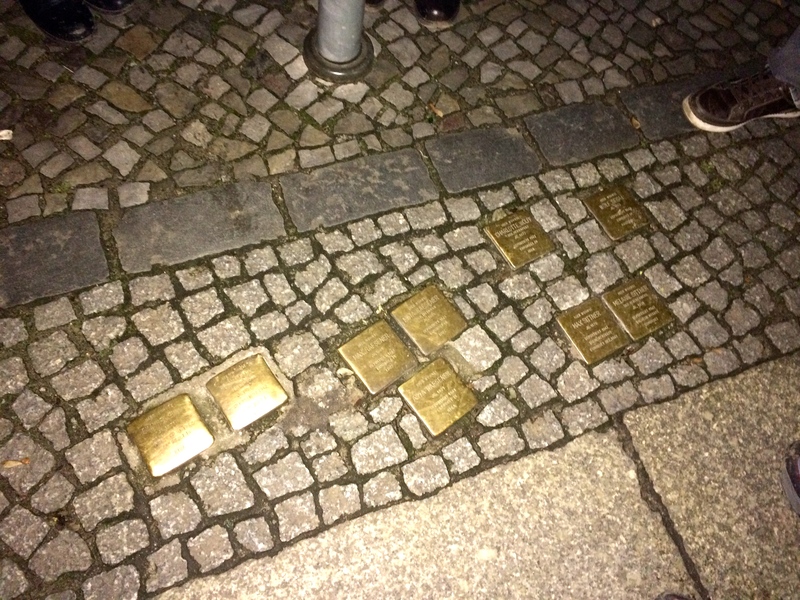 Throughout the Jewish quarter of Oranienburg, there lie small golden squares on the sidewalk. They lie anywhere; in front of apartment buildings, in front of restaurants, anywhere. 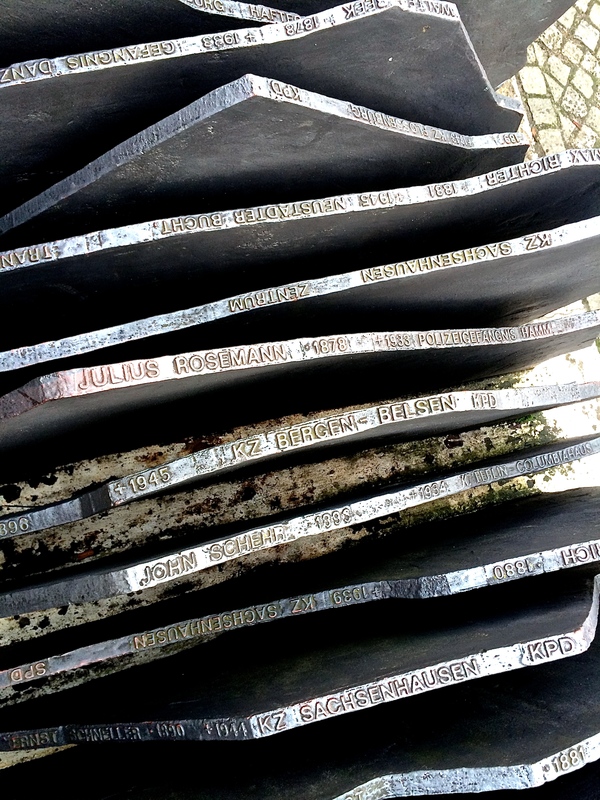 They are an everyday reminder and remembrance to the Jews who were taken from their homes and the dates they were taken. They lie in front of wherever they lived, and I found this to be an incredibly thoughtful and jarring everyday reminder of the lives lost. It’s no surprise that war history fascinates me, and Berlin has no shortages of that. The next walking tour that Jen and I went on was about the Cold War. Though the Cold War wasn’t so much a war as an occupation and divide, it still falls in the war history category. 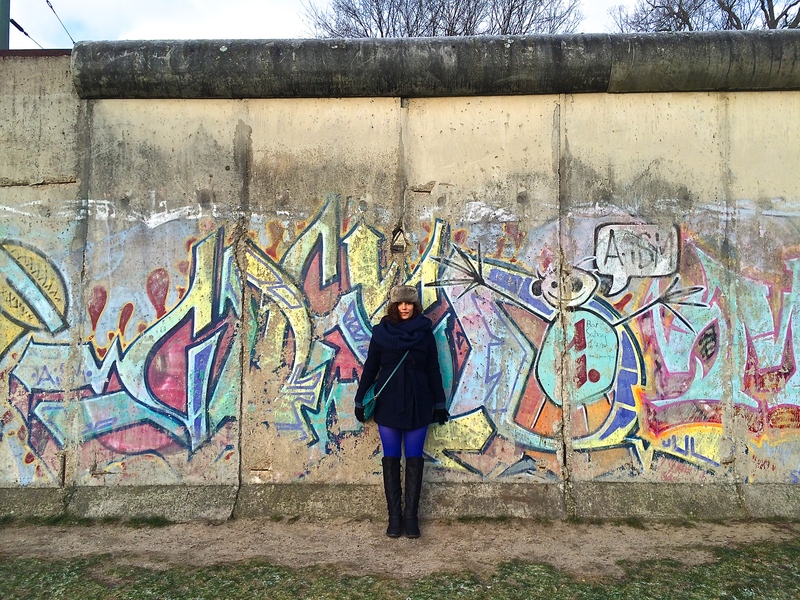 Before visiting Berlin I was pretty unknowledgeable about the Berlin Wall and East and West Germany. Really all I knew was that there was this massive wall put up, and that my mom had ‘accidentally’ hopped off a train in East Germany and got right back on after being bombarded by sights of soldiers with rifles in the station. Other than that I was pretty clueless. However, after a visit and some dropped knowledge, and staying in an Airbnb apartment just on the Eastern side of the wall, I can say there is no way to describe the feelings you get while being in a city once divided and with such a recent tragic history. With everyday reminders everywhere, it’s intriguing and mind blowing, and exuded some of the same vibes Cambodia gave me. 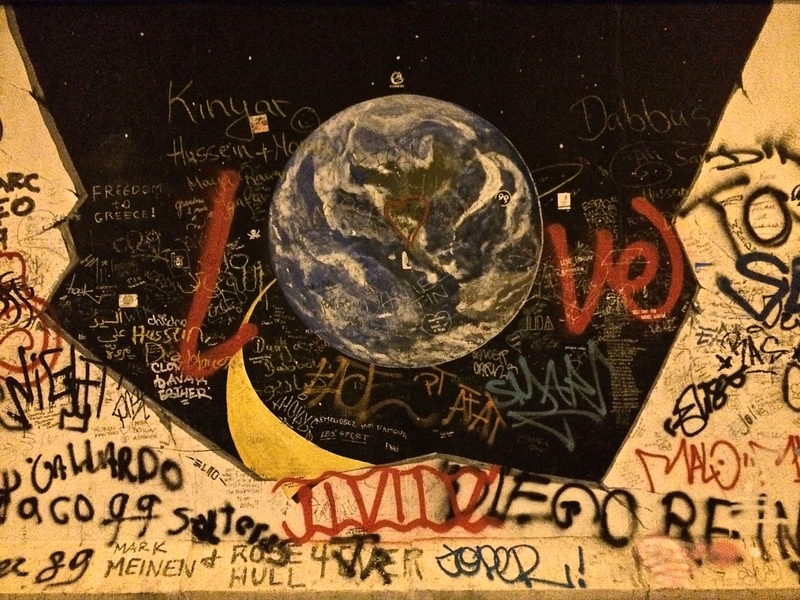 When Jen and I were walking to our Airbnb, we had no idea we were walking along the Berlin Wall Memorial. We just thought it was a bunch of reminders like we had already seen dispersed around the city. We later learned that we were in fact staying in an apartment just beyond the Eastern border, and that the memorial was in fact THE memorial, and a chance to walk amongst the Death Strip of the wall. The girl, Katherina, that we were staying with was the same age as me, and was born and grew up for the first 6 or so years of her life in East Germany. This information alone blew my mind. Sure she was probably too young to remember anything insane, but still. One of the things she told us about were typical East German names, and how you could pick out an East German based on their name. Fascinating. Living history. The memorial has former Stasi spy tunnels, images of people who’s homes literally straddled the border when the wall went up and were forced into life or death situations, homage to those who lost their lives trying to escape over the wall, homage to those who successfully escaped over the wall, and a chance to walk in the Death Strip – the space between the Berlin Wall and the smaller wall, where escapees were caught and usually killed. Standing on the Eastern Side of the wall. 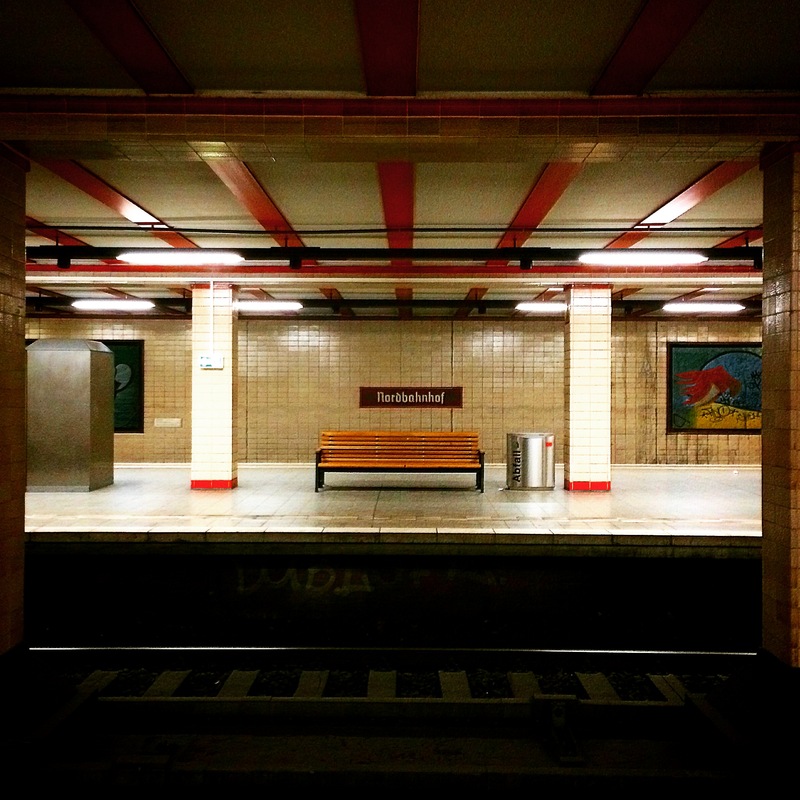 Our metro stop in Berlin was Nordbahnhof. 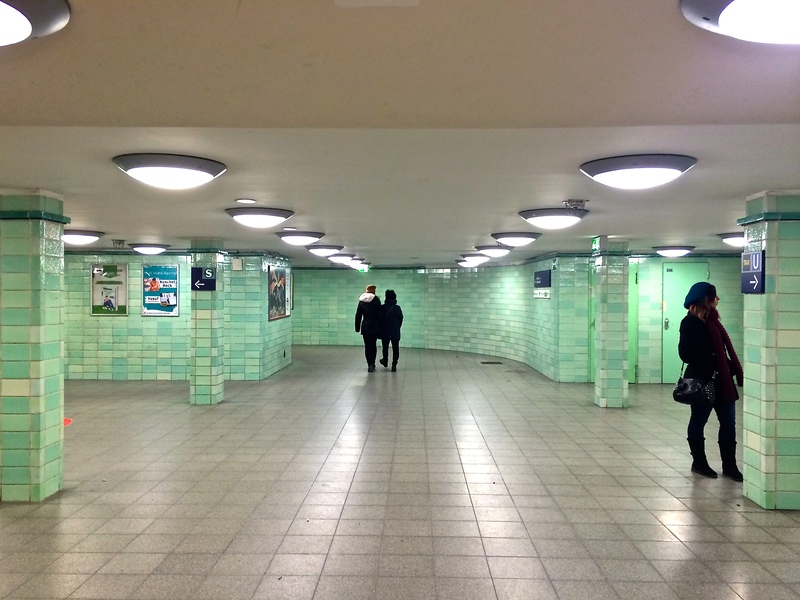 When we first got off at the exit there were so many information placards up on the walls of the station. I was immediately intrigued and read every one. After reading them I still didn’t make the connection that the stop we were in fact staying at was once a former Ghost Station; a station in the East that was blocked off to trains that had to travel through in order to get to the West. It never occurred to me that the metros were effected. I had never thought about all the logistics that go into dividing a CITY. After getting this bit of knowledge dropped on me, I immediately thought of the story my mom had told me about her time in Berlin. I never really understood the history behind her story until that moment, and of course – MIND BLOWN. 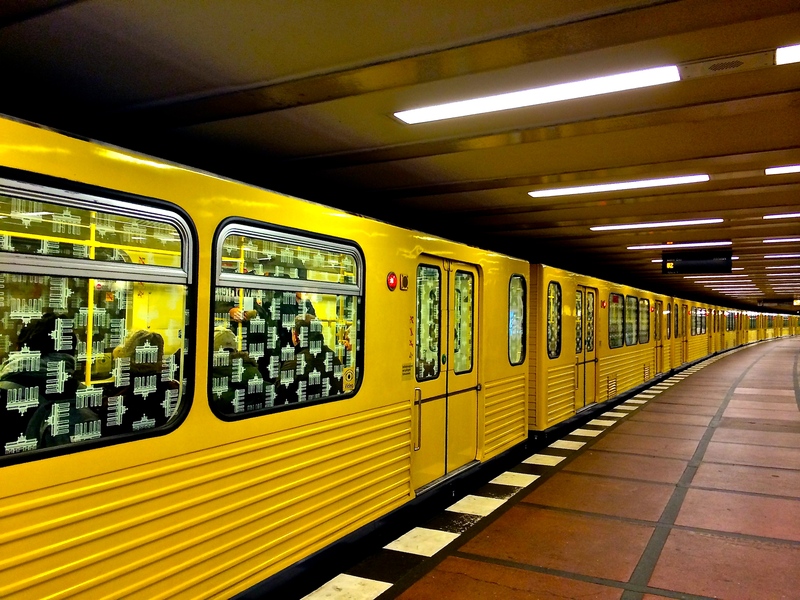 My mom was traveling Berlin in the summer of 1974, and when she hopped off the train in East Berlin, she was faced with so many guards and their rifles that it freaked her out and she got right back on the train. I’m still unsure of how she was able to hop off the train in the Eastern side, BUT, it all made sense when our tour guide said that all ghost stations used to be guarded by soldiers. When trains would pass through these stations, they’d slow down, but not completely stop. Travelers would be able to see into the desolate stations, but only the view of guards making sure no one escaped through the stations to the west. 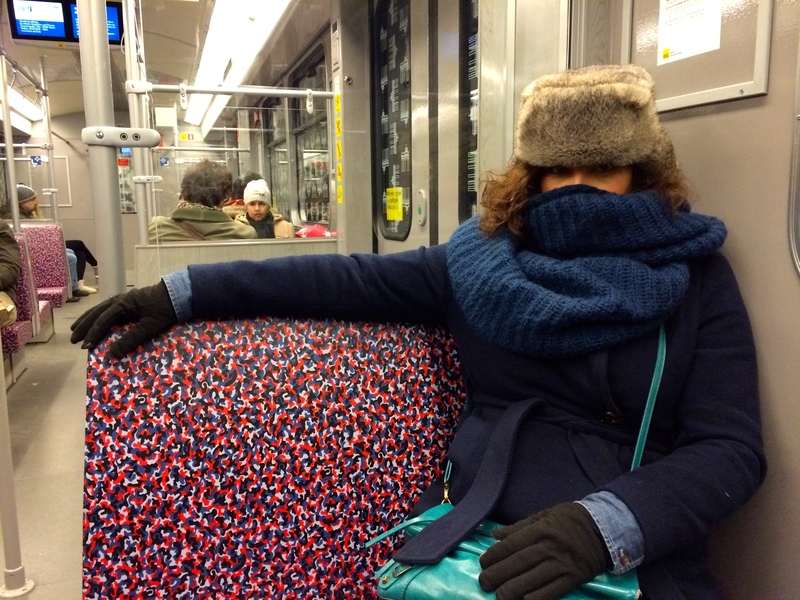 I immediately could not wait to tell Mama Schaeff the story behind her hop-off-hop-right-back-on story in Berlin. The only logical thing that I can think of as to how she hopped off, is that maybe ghost stations were still glitchy that early in the game, OR, just that this is Mama Schaeff and that would only happen to her. I’d like to believe the latter, since I am my mother’s daughter. 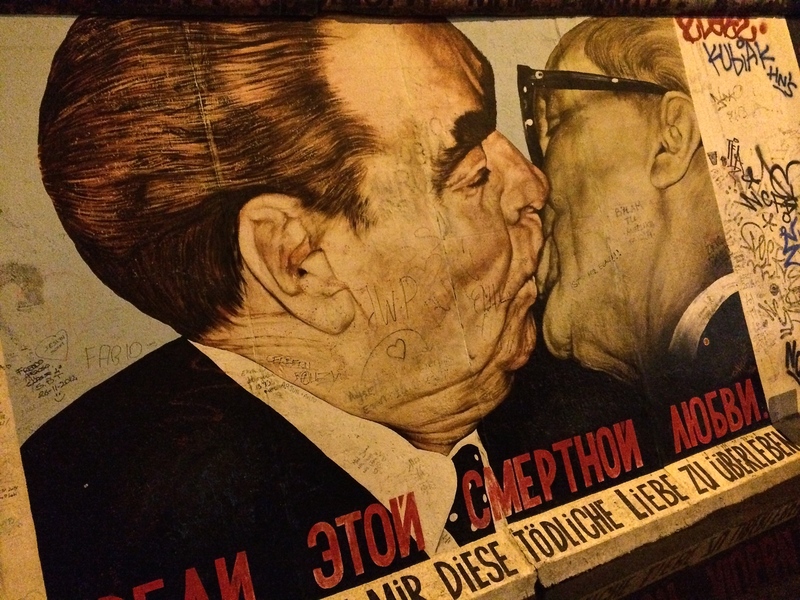 After WWII Berlin was divided into 4 parts: The French, British, and American in the West, and the Russian in the East. 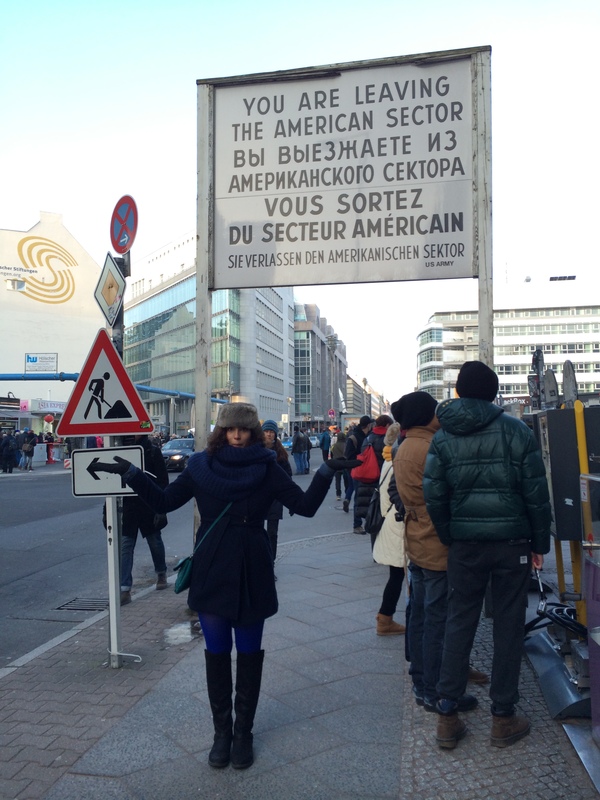 Checkpoint Charlie is the most famous crossing point between the East and the West. Now it’s a bit of a tourist trap, but has a museum (oddly selling American keychains), and apparently a place for you to get a stamp in your passport, should you chose to do that. Since no more Korean peace sign, this is what I now do with my arms. 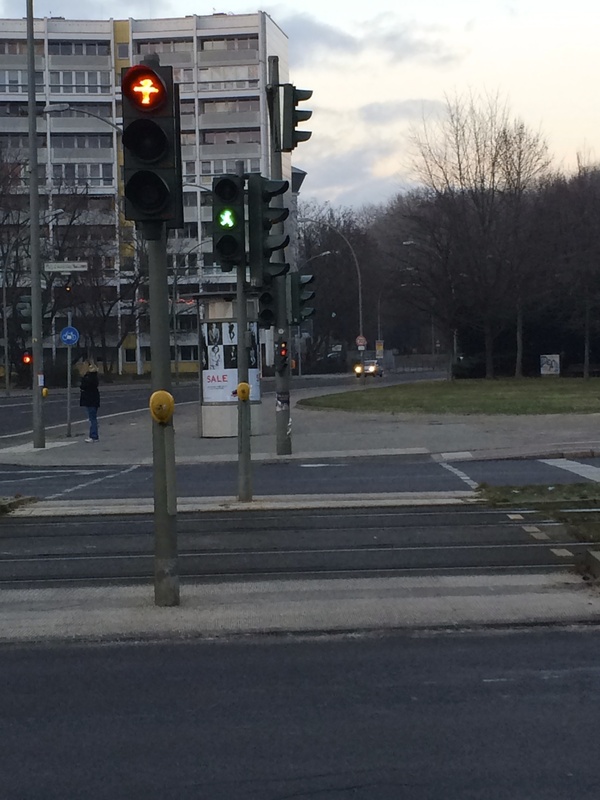 First, how many of you knew that the little guy who tells you when you can and can’t cross the street is called an Amplemann? Because I did NOT! Well, that is what he’s called, and when Berlin was divided into East and West, the East adopted their own special Amplemann, which is so cute and different from any I’ve ever seen. After the reunification, they decided to keep the Eastern Amplemann as a ‘souvenir’ of the East, and now you can see them and their little hats scattered throughout the East and the West. 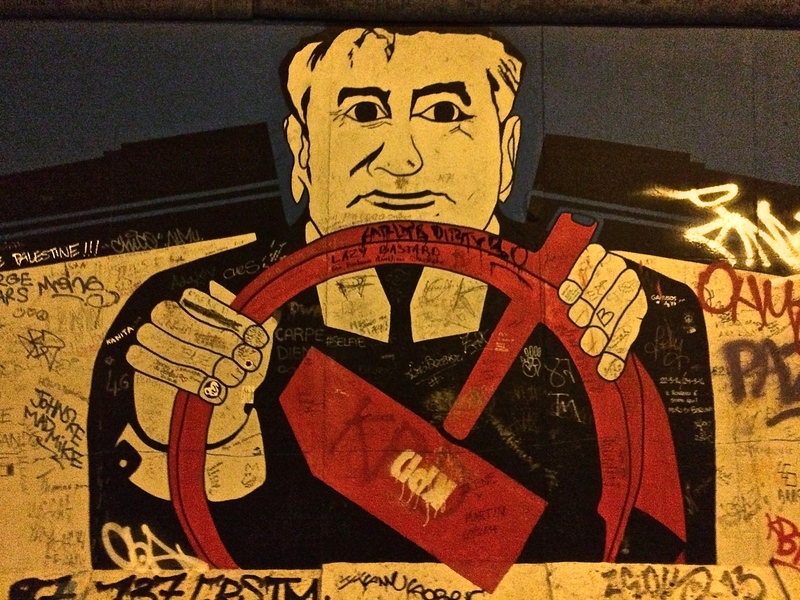 The East Side Gallery, otherwise known as the longest strip still remaining of the Berlin Wall, was turned into an art gallery for street artists in 1990 after the fall of the wall. We went on Christmas night, and it was absolutely freezing. I’m proud of us for braving the cold for as long as we did, though I wish we had gotten to see more of this spectacular gallery of street art. 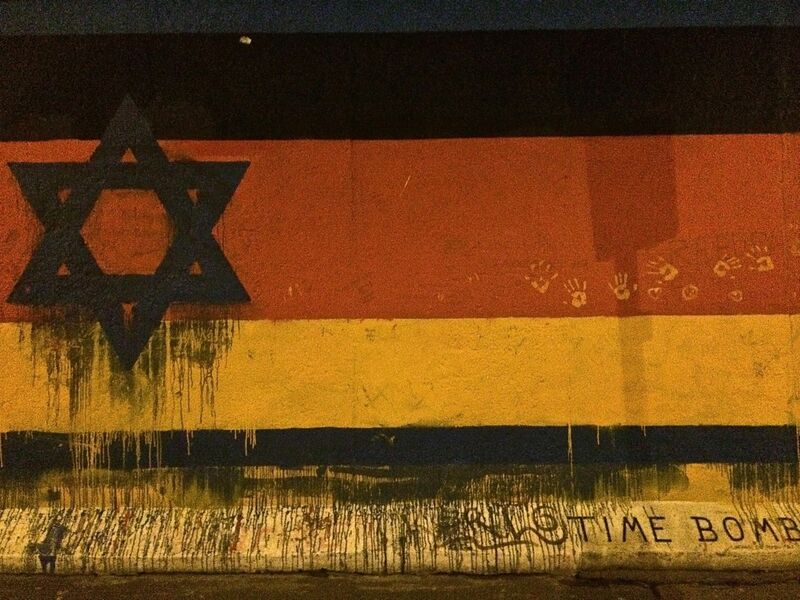 It’s painted with controversial works, works of love and abolishing divides, and everything in between. I especially love how something that tore so many families apart was turned into something unifying and so beautiful. It’s spectacular and was one of my favorite sites in Berlin. 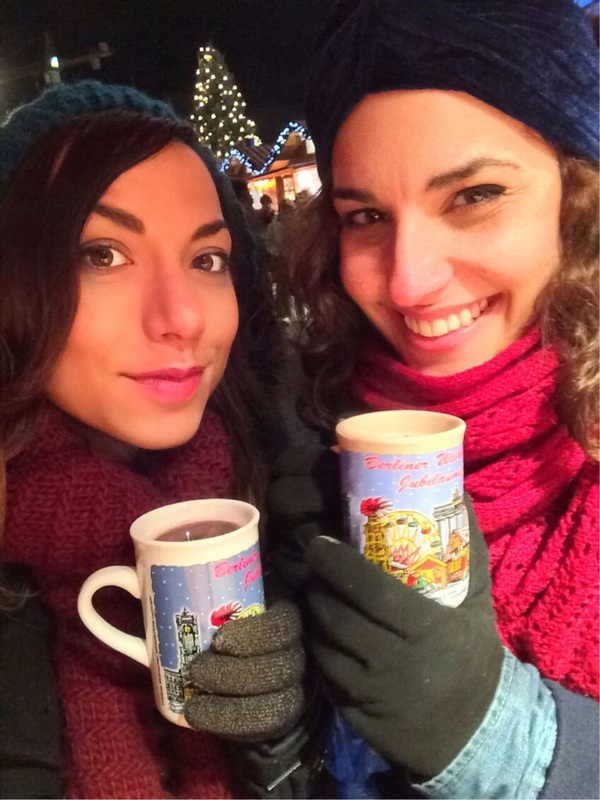 Gendarmenmarkt was our favorite Christmas market! 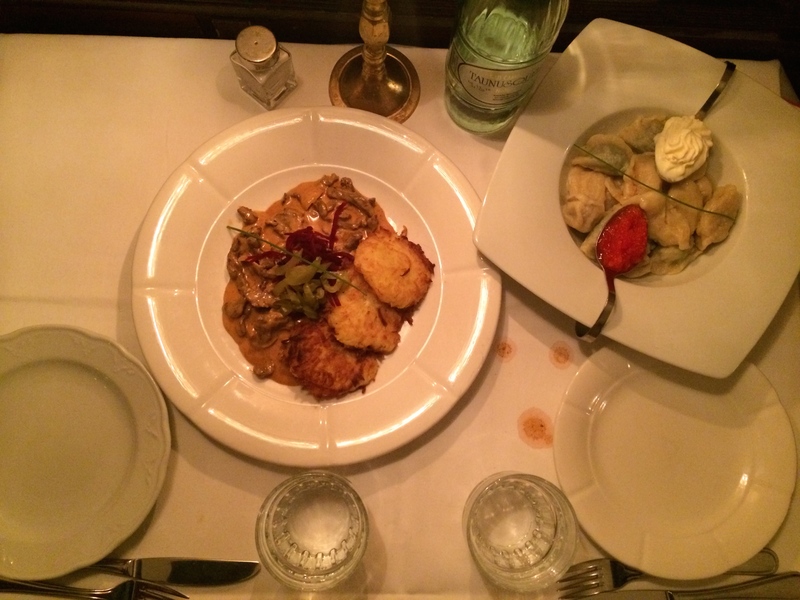 Pasternak served up the best Beef Stroganof, Potato pancakes, Pierogi, and not pictured, Borscht, that I’ve ever had. 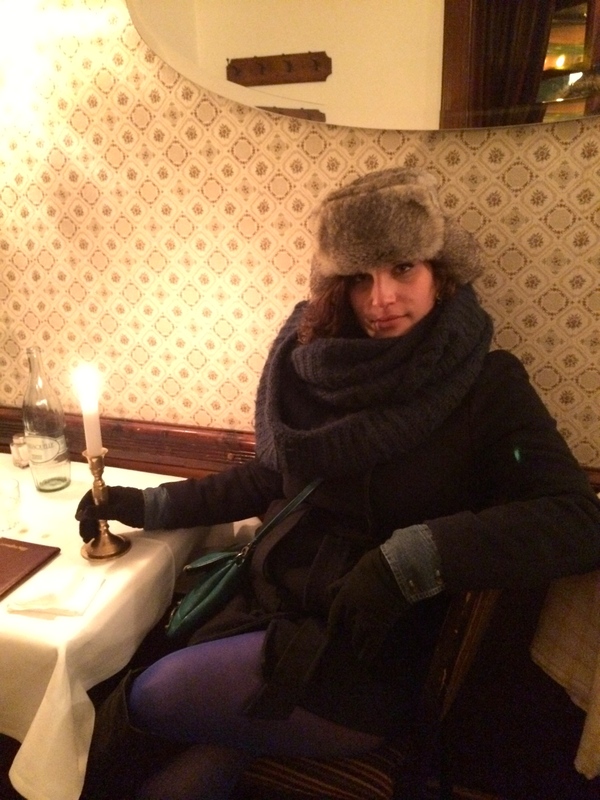 Just enjoying this very Russian wallpaper, in my Russian hat, by candlelight. Though proving for a most uncomfortable 6 hour journey, this is the best story I could have ever imagined for my German Jew departure. Well, there you go! 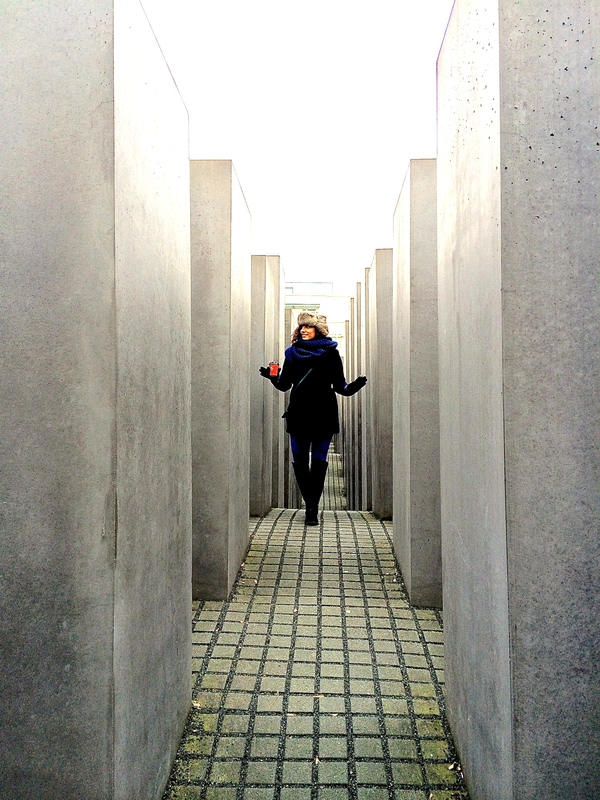 Even though my German journey came full circle to my Jewish heritage, Berlin has really barreled its way into my heart, and I’m not ashamed to say I’m obsessed with it. The city is thriving with delicious food, terrifying history, unbelievable sentimentality, insane street art, and what I’ve heard to be a poppin’ nightlife. I’ve put it on my horizon as a potential place to plant my feet for some time, and I just can’t wait to return. Have you been to Berlin? What are some places you’d recommend for a future visit? The more offbeat the better! Don’t forget, if you dug this post and others, follow my woes by subscribing here on the blog, via Facebook, and on Instagram.